I have been making electronic and sample-based music for over 10 years now and have released records. A consistent feeling that I get is that we are living in the future and therefore should be open-minded to new technology. Many things have changed in the world of music, one of them being the way in which we see and use the concept of a music studio. Before Brian Eno came along the music studio was simply seen to be a place in which to record the music. Brian Eno changed this with his ambient works and chose to use the studio as an instrument in itself. Now the studio is being abandoned completely and is now a virtual realm that can be used on any electronic device. Everything we need to make music is now contained within a laptop and this can sometimes stop the creativity from flowing effectively. The traditional way of making electronic music involved using physical electronic devices which were then connected together into a main mixer. The output would then be recorded and this would be the finished piece of music. The Korg Volca devices take this original style in which to make music and reincorporated in a new and more portable way. Users have the ability to create electronic music in exactly the same way as it was created when it started becoming popular as a genre in the early 90s. Users can now sync instruments together such as drum machines and synthesizers so that the sequences play in time. The user can then do a live performance which they record into a mixer and a recording device. What makes these machines brilliant is that they are small enough to take in a bag and can then be used wherever you like. This opens up the possibilities to music making as we are often inspired by our surroundings. Users can sit in in a park, on a boat, or on top of a pyramid in Egypt and sequence music. They are then inspired by their surroundings and this will feed directly into the music. Each unit has the ability to save sequences so the individual can leave their home with a empty device and then fill it up whilst on the go. 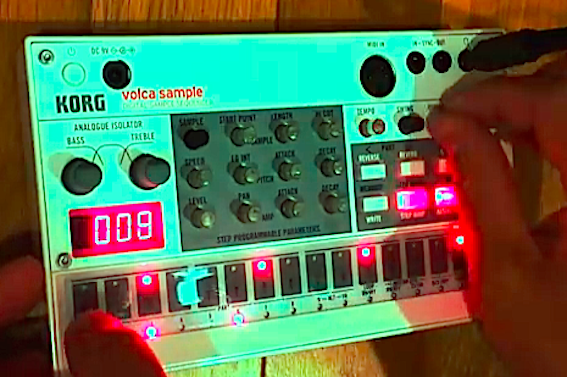 The new Volca sample takes this to the maximum and has six available spaces to save songs. Each song can save up to 16 sequences, allowing you the ability to create an EP or a mini album whilst on the move. Maybe you have a day job and your lunch breaks are dull, so you use one of these devices to create patterns whilst having your lunch. After a week of doing this you will have generated enough material to create an EP which you can then record live by playing the different sequences in real time, or record the device into your computer, laying it out in a sequencer such as logic or Ableton. The portability and ease with which you can connect the devices together means that music making will develop in new ways.